The mission of the St. John’s Worship Ministry Team is to facilitate worship that incarnates Jesus in our world. “Where two or three are gathered together, there am I in the midst of them.” That is Jesus’ promise to us, and nothing we can do can change the reality that Jesus is indeed present when believers gather together. But believers can make Jesus’ presence more or less visible to each other and to the guest and visitor. We can be clear and faithful witnesses to the God we worship or offer a distorted and weak image of Christ. It is our goal in the music ministries at St. John’s to faithfully witness to a Christ who is welcoming, compassionate, and life-giving. The God we worship is no cliché but is more than any one style or type of music or liturgy can comprehend. So we stretch toward the mystery not fully understanding all that God has packed into the music we perform but trusting the Holy Spirit to use us and use our song in ways we cannot imagine. Most of our choirs meet on Wednesdays during Beloved Community - which includes choir rehearsals, religious enrichment times, musical skill training, confirmation, fellowship, worship, a shared meal, and just plain fun. Beloved Community resumes on the Wednesday after Labor Day, and all of our singing choirs rehearse during that Wednesday evening program. There will be make up rehearsals for Cathedral Choir on Sunday mornings at normally at 9 am. Most instrumental ensembles rehearse on Sunday mornings as well. This early childhood music program meets from 6:30 to 7:30 in Room 7 (right off Weertz Hall), after the Beloved Community meal and worship. The first half of the hour will be music and singing led by Mackenzie Lyons, and the second half will be activities (stories, games, crafts) led by Elizabeth Arthur. 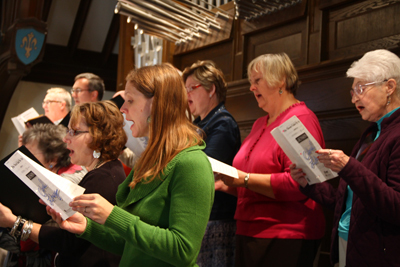 Joyful Noise sings in worship once or twice each semester. “Kisasa Wimbo” is Swahili for “New Song,” and this group of dedicated and talented choristers indeed brings a “new song” into our worship. These young people sing repertoire of many styles, times, and cultures. Also included in the Kisasa curriculum are handbells, percussion instruments, and visual arts, giving them a well-rounded, faith-based arts foundation. The youth are scheduled in worship about once a month at the 10 am service. This group also sings for the 5 pm Christmas Eve Service. Youth are welcome any time! For more information, please contact Beth Ann Edwards (bethann@stjohnsdsm.org). This choir is the signature singing ensemble at St. John’s with a storied history dating back seven decades. It rehearses from 6:30 to 8:00 pm on Wednesdays beginning the Wednesday after Labor Day, and sings at the 10 am service most Sundays. It also sings for liturgies at major festivals including the annual “Candlelight Carol” service with orchestra at 11 pm Christmas Eve. Its repertoire is broad, embracing traditional choral literature, spirituals and gospel songs, and world music, as well as cantatas, masses, and major works. There is no audition necessary to be part of this ensemble.